A 14-year-old pupil, Divine Toruemi, has been rewarded with N1m for rescuing a boy during a boat accident in Mgboudohia waterfront, Port Harcourt, Rivers State. Also, Mohammed Kenubu, who rescued a baby in a bomb blast in Kano, received N750,000; while David Adekunle, who cannily got the police to arrest some armed robbers, got N500, 000. 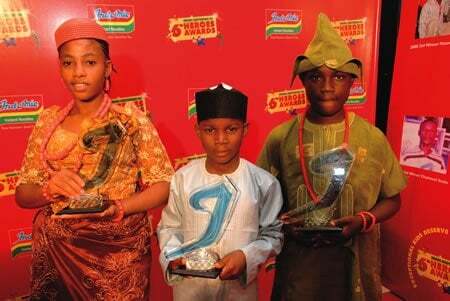 The trio earned the Indomie Independence Day Heroes Awards for 2013 at an event organised by Dufil Prima Foods Plc in Lagos. They were among the 14 children earlier selected for performing bravery act by the organisers. Toruemi, a Senior Secondary School II pupil of Foundation Group of Schools, Port Harcourt, said her recognition by the firm would spur her to serve humanity better. The youngster, who said she did not expect any reward for her act, pledged to always go the extra mile in assisting people. She said, “We were travelling in a boat on Mgboudohia waterfront that day when the boat capsized. Those of us who could swim maneuvered and luckily, we found ourselves at the bank of the river. From that point, I saw a boy who was still floating and struggling to swim. “I felt pity and decided to risk my life to return to the water to rescue him. Others that escaped did not bother to do anything. But thank God, I brought the drowning boy out of the river successfully and he did not die. At the end, 49 people died in the accident. For Kenubu, who picked a baby in a blast in Kano, it was mere instinct that propelled him to accomplish the feat. He said, “I was going and I just heard the sound of a blast. Everybody started running and I ran too. As I was running, I decided to look back and I saw a woman with her baby beside her. “People were jumping over the mother and baby, but my mind told me to go and pick the baby. I later ran back to pick the baby and took him home. When I got home, my mother was shocked and furious at me. She asked me to return the baby to where I found it, but I begged her to let us save the baby’s life. Eight-year-old Adekunle of Galaxy International School, Minna, Niger State, who got robbers arrested through his intelligent, careful and good judgment, said he took the decision because he hated stealing. He said, “I was washing plates in the kitchen that day when three robbers came into our house. They went into our bedroom and took my daddy’s laptops and other electronics. “They never knew I saw them. Immediately they went down, I followed and started tracking them. Luckily, I saw a neighbour of mine who rides motorcycle. I stopped him and explained what happened. I told him I wanted to know where the robbers were going to. The winners, who were tagged ‘Heroes”, thanked the firm for the money given to them. Justifying the awards, the Chairman, Dufil Prima Foods, Mr. Haresh Aswani, said the gesture was meant to identify and reward children whose heroic acts touched lives. He added, “This event is significant because it is rooted in the recognition of those whose best efforts are very often overlooked by the society. On a daily basis, our beloved Nigerian children perform thousands of heroic acts at great personal risk. The company’s Chief Executive Officer, Mr. Deepak Singhal, in a documentary tagged ‘IIDA: The Journey So Far’, promised that the company would always celebrate children who serve as change agents in their communities. Human rights activist, Dr. Joe Okei-Odumakin, who spoke on “Children as Agents of National Transformation”, lamented the dearth of moral standards in the country. She said, “The future of every nation is dependent on the youth, many of whom are children. Hence, it is pertinent for a nation that wants to grow to make conscious efforts to provide a better future for them, as the nation’s destiny lies in their hands.